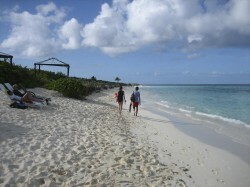 We spent a couple days in Anguilla on East Shoal Bay Beach. 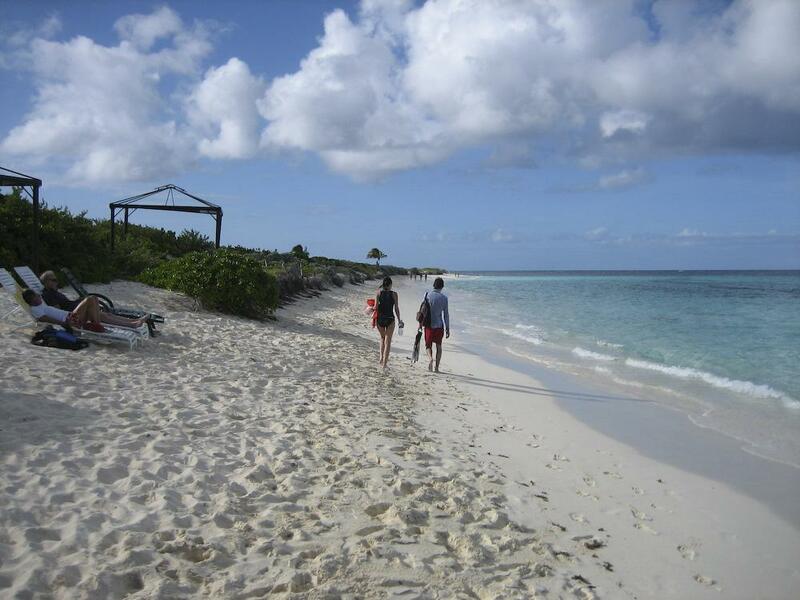 Although it is supposed to be one of the most beautiful beaches in the world, it didn’t impress us on that level. The sand was beautiful, white and clean, but the beach wasn’t very wide. In addition, during the 4 days we were there, only the first day had calm weather – the rest of the time it was raining, or windy enough that we couldn’t really enjoy the beach. The beach goes on for a long time, so it’s possible to go for a long walk along the beach (in fact this is the easiest way to get between the different restaurants). In front of the Allamanda Beach Club, where we were staying, there wre many loungers set up. It wasn’t clear if they belonged to the club or to Gwen’s Reggae Bar and Grill (the cheap restaurant on the beachfront), but no one bothered us when we used them. The beach was never crowded.